Winter is the time for slow, quiet movement, careful observation, and staying warm and dry. Seek haven at the season’s best exhibitions of Indigenous cultures in British Columbia’s Museums and Indigenous Cultural Centres. 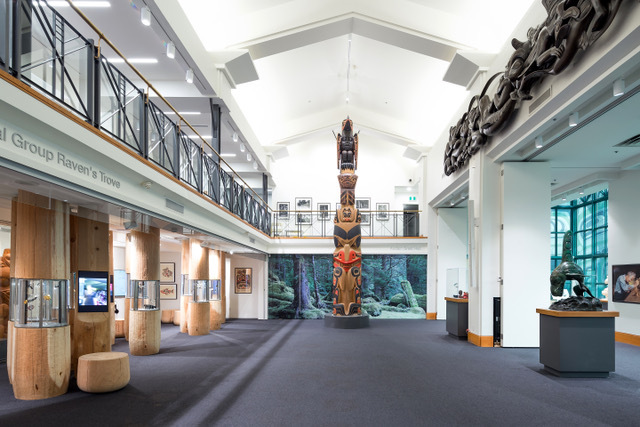 Step into modern cedar and glass rooms and behold pieces that are more than artifacts–they are active pieces from the land and cultures of BC’s living Indigenous peoples. Indigenous cultural exhibits are innovative and immersive. At the Museum of Anthropology (UBC), sit in a storytelling chair and sink into sound recordings made by living speakers of ancient Indigenous languages. Step into an oceanfront longhouse in Prince Rupert’s Museum of Northern BC and see the regalia of chiefs and shamans. The best Indigenous cultural displays are authentic and respectful. They are created with, owned by, and reflective of the values and designs of the Indigenous people they belong to. Current museum ethics encourage the return of cultural items to their owners: the living people. Most museums offer free admission to Indigenous visitors, an act that supports the reconnection of Indigenous people with artifacts of deep meaning and significance to their families and communities. Indigenous Cultural Centres like the Nk’Mip Desert Cultural Centre in Osoyoos and the Squamish Lil’wat Cultural Centre in Whistler are hosted by local Indigenous cultural ambassadors who take an active part in cultural preservation and revitalization. These centres often offer workshops in traditional crafts like drum making and cedar basket weaving. Meet and learn from living local knowledge keepers if you are looking to connect deeply to the restorative magic of the Pacific Northwest and its vital Indigenous cultures.